Here are the answers to my last posting on California politics. A couple of them were a bit tricky. One Halloween in the 1950s, my Republican father took me around the neighborhood. As he sent me up to knock on the first door, he told me to say “trick-or-treat” and then, after I got my treats, to say “I like Ike!” I did as he said and was rewarded with an additional handful of candy. Jackpot! I tried it at the next house and again got extra treats. Whatever your reasons for how to cast your vote, just vote! Ancestry.com has California voter registrations on their site. The lists are said to be from 1900 through 1968 but coverage varies vastly by county. The rolls include address, party affiliation, and often occupation. Here is a list of some famous Californians and their listed occupations. Can you guess their party? I’ll post the answers in a day or so. Henry Paulson, the Secretary of the Treasury, has an interesting family tree, with several Chicago lines. These branches are populated by doctors, architects, Montgomery Ward presidents, coopers, and Norwegians. Paulson’s mother’s maiden name might be familiar to long-time residents of Chicago. Her paternal grandfather, Carl Gallauer, was the founder of Zum Rothern Stern, later the Red Star Inn, a popular German restaurant located on North Clark from 1899 to 1970. Through his mother’s other line, her maternal side, Paulson is a descendant of Ernst Schmidt, German intellectual, Civil War surgeon, and the first coroner of Cook County. Called the “Red Doctor” not just because of his red hair, Schmidt was a lifelong socialist. As detailed in Der Rothe Doktor Von Chicago, Schmidt was a staunch defender of the laboring poor who led the defense committee for the anarchist organizers of the 1886 Haymarket riot. Completely unconnected to that event, one of the rocks thrown by the Weathermen during the riot at the 1968 Democratic convention smashed through the window of the Red Star Inn. George’s parents, Patrick Carlin and Mary Bearey, married in Manhattan on Nov 26, 1930. Mary’s parents were Dennis and Mary Bearey. Grandpa Bearey died when George Carlin was 2 months old. Grandma Bearey had died a couple years before George was born. Mary left her husband when George was a wee lad so I doubt if they hung around with the paternal grandparents. Besides, the father of the man I think is George’s father was born in 1850. When George was 4, this man would have been 91. While I am sure as an Irish father of 10 he could still #3 his wife, climbing the stairs might have been too difficult. History Detectives is a good term to describe genealogists but it’s also the name of a show on PBS. It’s kind of like Antiques Roadshow in that they take an item and tell its history. Much more in depth than the Roadshow; they solve three cases per show. I like how they show that small things can be part of a bigger theme. They never solve a case in a direct way, however. I think it’s part of their educational aim, telling us the history of the Wild West or a timeline of board-game development to get to the answer. Although they may want me to learn something about history – which I often do – it’s their methodology that I watch it for. Often times the processes used in genealogy apply to a case. A recent episode I saw showed them solving all three cases by using the Internet to search for records. They didn’t make it obvious but to someone who spends hours a day there, I easily recognized Ancestry.com. I thought perhaps Ancestry.com had sponsored the show, but saw no evidence of it in the credits. I guess it just happens. Kind of like my blogging about PBS shows. If you like these type of hunts, check out Megan Smolenyak’s latest quest. She is a pro at solving history mysteries and her solutions are always direct and elegant. You can see the segment at the Antiques Roadshow website on PBS.org. Here is what I find when I finally check it out. 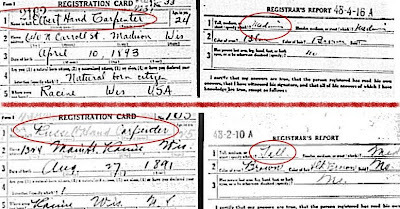 In the 1930 census, where Martin lived in Philadelphia in the same household as his brother Hans, he said he first came to this country in 1923. 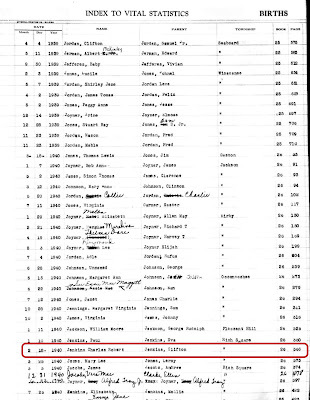 The April 27, 1923 passenger list of the SS Hannover includes Martin Nebel, violin maker aged 26, born in Mittenwald, joining his uncle Martin Nebel in New Jersey. He states that he has never been in the US before. He appears to have traveled back to Germany in 1927, 1929, and 1932. Each time he returned he was asked if he had been in the US before. Each time he said he had first arrived in 1923. Clare Givens was pleased when she heard about the records. She told me she had thought the label said 1924 but the producers (dodos!) convinced her it said 1921. Jesse Helms died recently of “natural causes” and I’m thinking maybe it was because his pedigree finally collapsed completely. A Helms through and through, he had a family tree that was more like a family shrub. Pedigree collapse is what happens when cousins marry. Their kids get less ancestors because the cousins share the same grandparents. If the parents were not related, the kids would have 4 sets of great-grandparents. But if the parents are first cousins, one couple takes up two slots and the kids have just 3 sets of g-grandparents. Same thing happens when 3rd cousins marry. They share the same g-g-grandparents, so those branches on the high end of their kids’ family tree get pruned. The kids get 15 pairs of g-g-g-grandparents instead of 16. No big deal, happens to all of us sooner or later. Demographers say that the family tree of a typical English child born in 1947 would have 5% of the ancestor slots filled by duplicates in the generation living in 1492. In the case of Jesse Helms, his paternal grandfather Joseph Helms had just 12 sets of g-g-g-grandparents instead of 16. Five of Joseph’s 8 great-grandparents were grandchildren of John Isaac Helms and Ann Tilghman who were born in the 1690s. To make it less abstract, imagine that your parents were first cousins who married each other and had you and your brother. Your brother married a woman from out of town but you married a child of one of your parents’ other first cousins. Your son and your brother’s daughter married and had a child. This describes Jesse Helms’ Grandpa Joseph. But wait, there’s more. Grandpa Joseph married a cousin who had one quarter of her g-g-grandparents slots filled by grandchildren of John Isaac Helms and his wife Ann. Grandpa Joseph and his wife were the parents of “Big Jesse” Helms, the father of the recently departed Jesse Helms. Oh, and by the way, the late senator's mother was Ethel Helms, another descendant of John Isaac Helms and his wife Ann. Jesse Helms’ peculiar ancestry was explored by John Anderson Brayton in the December 1991 NEHGS NEXUS. You can read more on the fascinating topic of pedigree collapse [ overview ] [ in-depth] or analyze Jesse Helms’ pedigree yourself. I recently attended the SCGS Jamboree and had a blast. One of the highlights was the blogger summit where I got to meet a bunch of great bloggers. I had met none of them in person before but I had read and enjoyed all their blogs. The summit made me nostalgic for my own blog and got me thinking I might see if I could revive it. So why did I stop? One was technical. Some kind of confusion about my account and identity that I just got tired of trying to figure out. I'm still not sure it's cleared up but I seem to be able to post this. Another reason was that I got busy. One of the motives for this blog's existence was to give me an outlet for my genealogy addiction. Some time before my last post on this blog, I found another way to channel my obsession. No predictions on how I'll deal with this in the future, but I’m here for now. Back at the SCGS conference, I had a brief encounter that made me smile. While waiting for the start of the blogger summit, I went over to Randy Seaver’s wife (easily identified in her "Geneaholic's Widow" T-shirt) to introduce myself and make small-talk. Randy is, of course, the geneaholic behind Genea-Musings and he was one of the panelists we were there to hear. Linda and I chatted a bit about our families and then she asked me, "So how do you know Randy?" Made me think she might not fully appreciate the impact of blogging and why all those people were in the room.